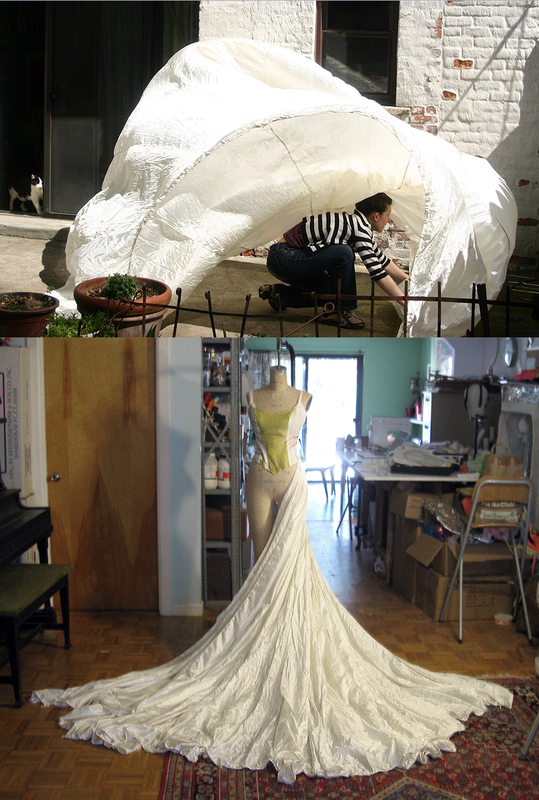 Years ago Brooke, knowing what kind of work I do, asked if I’d make her wedding dress. Thinking she was joking or just being nice I said yes. Flash forward five-ish years. I get a call from Brooke. “I’m getting married! 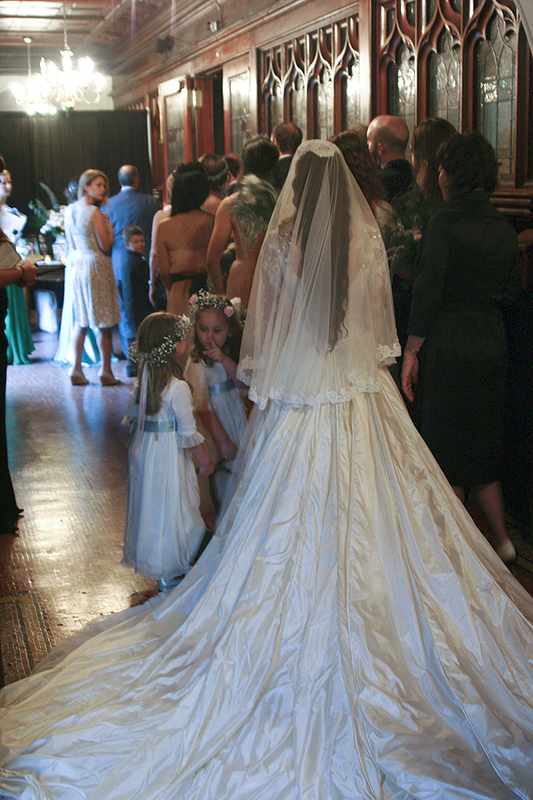 Remember you’re going to make my wedding dress.” She was serious. So excited and nervous we began. 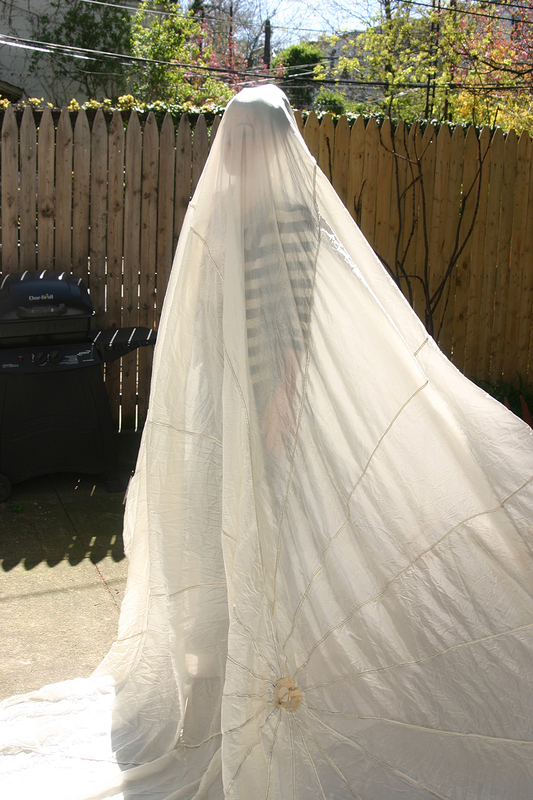 Brooke found a nutty bride’s dress from the 70’s that was mostly tulle and beaded applique, a friend of mine donated a white satin dress he had around the house, I fell in love with a WWII silk parachute – we had our materials. We stripped apart, reworked, and reconfigured these materials and fashioned a dress (loosely inspired by the white peacock.) 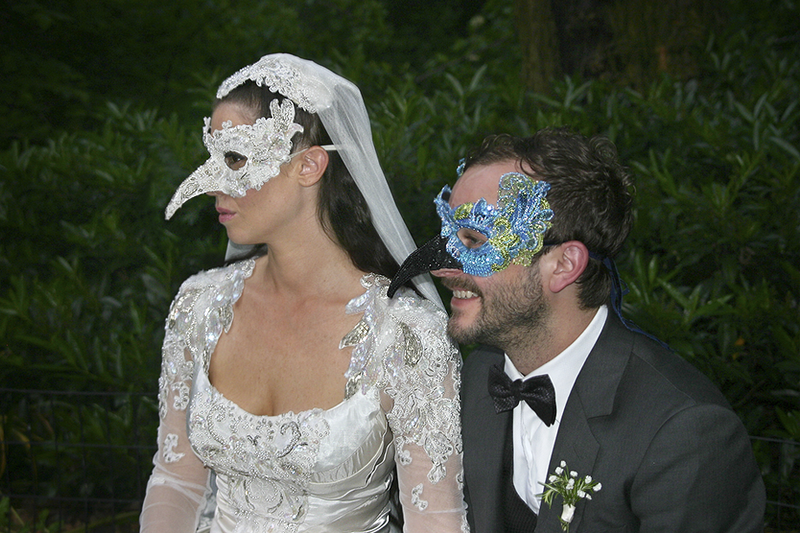 The wedding had a myth/ storybook theme to it with a masked ball reception afterwards. Guests were given masks to wear when they arrived and the bride and groom entered the hall after the ceremony wearing peacock masks. 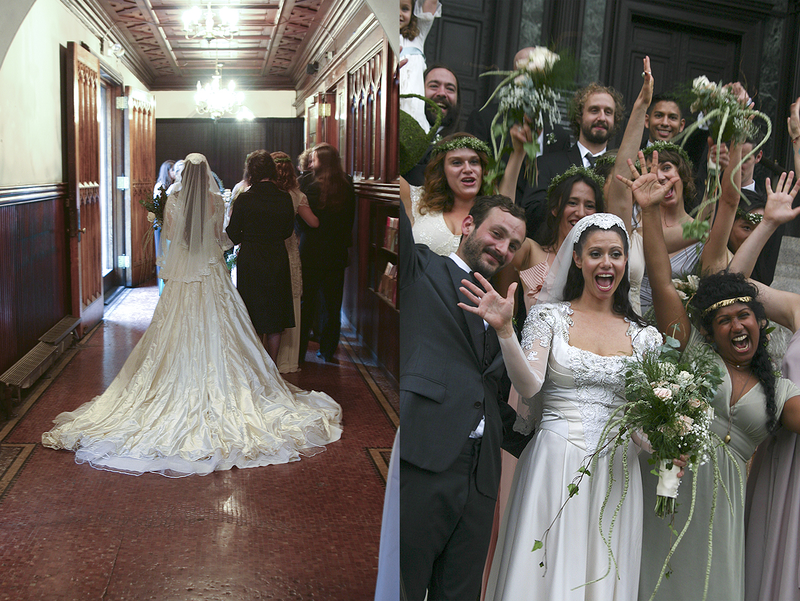 A lot of the work I make is used for art and performance purposes (costumes, masks, set pieces…) And honestly you don’t have to stretch the imagination much to see a wedding as performance art. 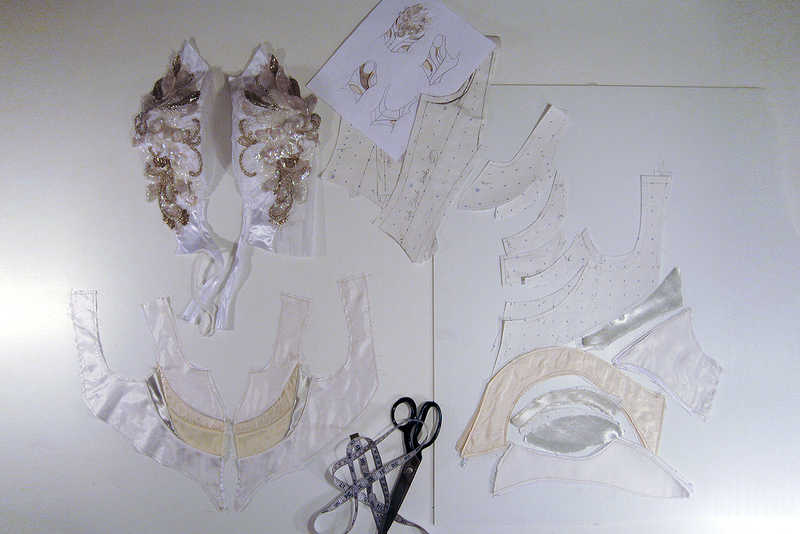 It’s been exciting making the centerpiece costume for an ancient ritual. 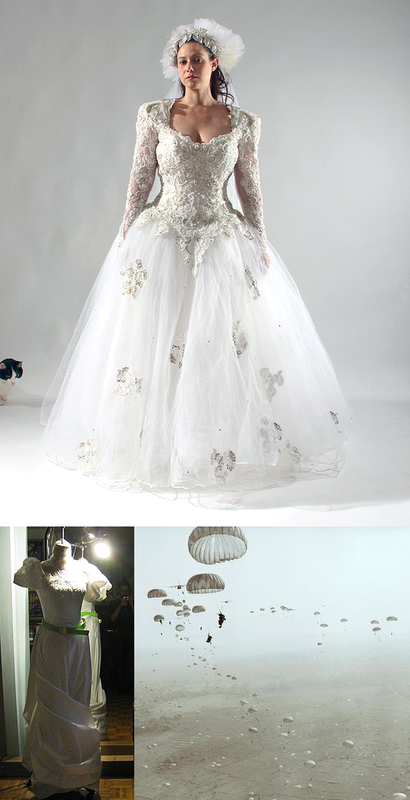 And Brooke was awesome and open to me making the dress in a way that was interesting to me. Using these material harvesting techniques is appealing to me. They give one a set of limitations to work within that often leads to unexpected results. Sometimes those results can be quite wild but I don’t think that’s the case here. I think Brooke’s dress is unique, flashy, and lovely in a subdued way (for me.) Knowing where it came from I think we streamlined and reworked well. Brooke looked beautiful and she was happy. And I’m very pleased with what Rebekah and I made together. Mission accomplished.